OSAKA - Yokozuna Hakuho survived an epic encounter against Estonian giant Baruto, outfoxing his opponent to retain his undefeated mark on the 10th day of the Spring Grand Sumo Tournament on Tuesday. With the victory the sole leader improved to 10-0 with just five days left at the 15-day tourney, and put more space between himself and the closest men in the title race as he bids to win his 24th career Emperor’s Cup. Rank-and-filer Okinoumi is the only wrestler now with a fighting chance of catching Hakuho at 8-2, but such a scenario is highly unlikely unless the yokozuna were to suffer a meltdown. Rival yokozuna Harumafuji, who made quick work of Shohozan (6-4) with a frontal forceout in the day’s penultimate bout, features in a logjam of eight wrestlers tied at 7-3. In the day’s finale at Bodymaker Colosseum, Hakuho had to sweat out a lengthy match as neither man could gain leverage until the yokozuna deployed a perfectly timed pulling overarm throw, when his opponent tried switching grips and came lunging forward. Baruto, who is making a fresh start at sumo’s third rank after failing to regain his ozeki rank in January, slipped to 6-4. 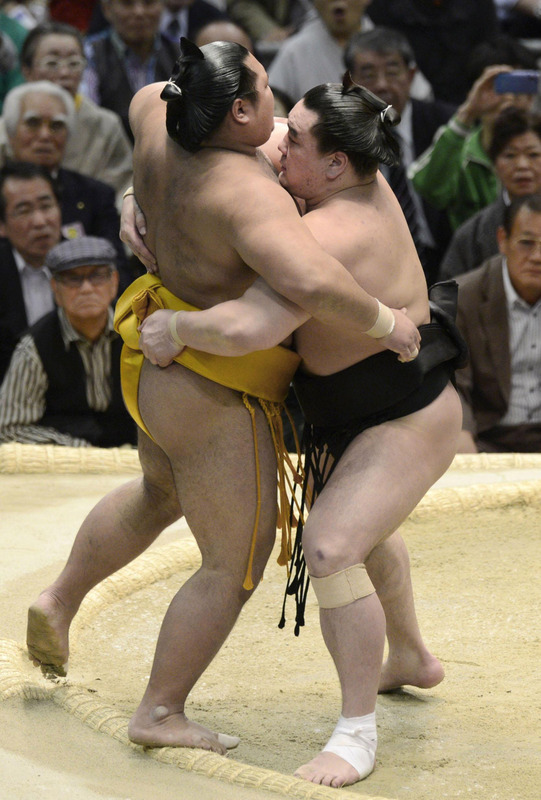 Kotoshogiku dropped back in the title race after suffering a third defeat at the hands of yokozuna destroyer Toyonoshima, who got his left arm under the ozeki’s armpit before sending him sprawling with a beltless arm throw. Toyonoshima, a former sekiwake who has beaten both Harumafuji and ozeki Kakuryu here, put another big notch in his belt by taking out the ozeki to improve to 7-3. Kakuryu (5-5) was the other wrestler from sumo’s second-highest rank to taste defeat, when he was outmuscled by Tochiozan and dumped to the dohyo surface. Tochiozan, who moved to 5-5, has beaten all of the ozeki at this basho, including Kotooshu who pulled out on the fifth day. 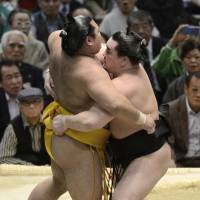 Kisenosato (6-4) was the only ozeki to land in the winner’s column, crushing local favorite Ikioi (2-8) with a thrust-down technique after the pair grappled momentarily. Osaka native Goeido (7-3) swiftly disposed of Georgian Tochinoshin (4-6) with a smack-down technique in an earlier bout.